Girl Rising is a groundbreaking film, directed by Academy Award® nominee Richard Robbins, which tells the stories of 9 extraordinary girls from 9 countries, written by 9 celebrated writers and narrated by 9 renowned actresses. Girl Rising showcases the strength of the human spirit and the power of education to change the world. Writer/Director Jennifer Siebel Newsom interwove stories from teenage girls with provocative interviews... to give us an inside look at the media and its message. As the most persuasive and pervasive force of communication in our culture, media is educating yet another generation that a woman's primary value lay in her youth, beauty and sexuality - and not in her capacity as a leader, making it difficult for women to obtain leadership positions and for girls to reach their full potential. 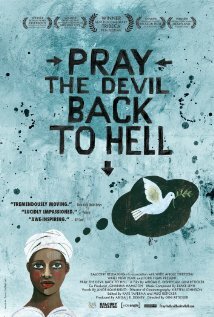 Pray the Devil back to Hell chronicles the remarkable story of the courageous Liberian women who came together to end a bloody civil war and bring peace to their shattered country. A story of sacrifice, unity and transcendence, Pray the Devil Back to Hell honors the strength and perseverance of the women of Liberia. Inspiring, uplifting, and most of all motivating, it is a compelling testimony of how grassroots activism can alter the history of nations. In a world of secrecy, corruption and injustice, a single voice can tell a true story that changes everything. This is what lies at the heart of the emotionally charged experience of The Stoning of Saroya M. Based on an incredible true story, this powerful tale of a village's persecution of an innocent woman becomes both a daring act of witness and a compelling parable about mob rule. Women, War & Peace is a bold new PBS mini-series challenging the conventional wisdom that war and peace are men’s domain. The series places women at the center of an urgent dialogue about conflict and security and reframes our understanding of modern warfare.